For the Achaemenid satrapy of Arabia, see Achaemenid Arabia. Arabia Petraea or Petrea, also known as Rome's Arabian Province (Latin: Provincia Arabia; Arabic: العربية البترائية‎) or simply Arabia, was a frontier province of the Roman Empire beginning in the 2nd century; it consisted of the former Nabataean Kingdom in Jordan, southern Levant, the Sinai Peninsula and northwestern Arabian Peninsula. Its capital was Petra. It was bordered on the north by Syria, on the west by Iudaea (merged with Syria from AD 135) and Aegyptus, and on the south and east by the rest of Arabia, known as Arabia Deserta and Arabia Felix. 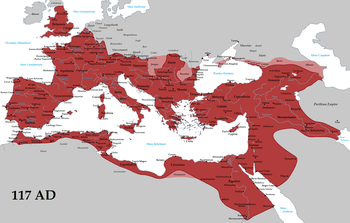 The Roman Empire c. 117 AD, with the province of Arabia Petraea highlighted. The territory was annexed by Emperor Trajan, like many other eastern frontier provinces of the Roman Empire, but held onto, unlike Armenia, Mesopotamia and Assyria, well after Trajan's rule – its desert frontier being called the Limes Arabicus. It produced Philippus, who was born around 204. As a frontier province, it included a desert populated by Arabic tribes, and bordering the Parthian hinterland. Though subject to eventual attack and deprivation by the Parthians and Palmyrenes, it had nothing like the constant incursions faced in other areas on the Roman frontier, such as Germany and North Africa, nor the entrenched cultural presence that defined the other, more Hellenized, eastern provinces. The Roman Empire in the time of Hadrian (ruled AD 117–138), showing, in western Asia, the imperial province of Arabia Petraea (Jordan/NW Saudi Arabia/Sinai). A single legion was deployed there in 125 AD. The geographic makeup of Arabia has some variation. It includes the comparatively fertile Moab plateau, which received 200mm of annual rainfall, at the southernmost tip of which lies Petra which, along with Bostra (or Busra), together constitute the political foci of the province. Inhospitability is the norm, though, and along with the desert proper that is the Sinai, the arid Negev, which extends north of the Sinai, is practically such. Along with this are the coastal areas around the Red Sea; the badlands known as Hismā that develop to the north of that coast; and the ever-present rocky terrain. Petra, now designated as a World Heritage Site by UNESCO. Most of Arabia was sparsely populated, and its cities can be found concentrated to the north, toward the Jordan. The only major port is Aqaba, which can be found at the tip of a wide gulf from the Red Sea bearing the same name. There is some disagreement as to what was the capital of the province, with claims that Bostra, near the border of the province of Syria, as the sole capital and other claims that both Petra and Bostra served that purpose. Petra served as the base for Legio III Cyrenaica, and the governor of the province would spend time in both cities, issuing edicts from both. Upon annexation of the province, Bostra gained the appellative “Traiane” when Trajan declared it the capital while Hadrian performed the same ceremonial act for Petra when he became emperor. Before Roman control, the area was ruled by Rabbel II, last king of the Nabataeans until 106 AD. When Rabbel II, who had ruled since 70 AD, died, the Third Cyrenaica legion moved north from Egypt into Petra, while the Sixth Ferrata legion, a Syrian garrison unit, moved south to occupy Bostra. The conquest of Nabataea can be best described as casual, an act by Trajan to consolidate control of the area before acting on his designs for territory across the Tigris and eventually into Mesopotamia proper. There is no evidence of any pretext for the annexation: Rabbel II had an heir by the name of Obodas and though there was little fighting and gloria (attested to by the fact that Trajan did not adopt the appellation Arabicus, as he did Dacius when he conquered Dacia), there does seem to have been enough of a defeat to cause some humiliation on the part of the Nabataeans. The two cohorts that eventually found themselves in Arabia had been sailed from Egypt to Syria in preparation for the action, which despite some resistance among the Nabataean royal guard, seemed to be not entirely resisted by the Nabataeans, suggested by the fact that the Nabataean troops served as auxiliary troops supporting Roman legions soon after conquest. The conquest of Arabia was not officially celebrated until completion of the Via Nova Traiana. This road extended down the center of the province from Bostra to Aqaba. It isn’t until the project is finished that coins, featuring Trajan's bust on the obverse and a camel on the reverse, appear commemorating the acquisition of Arabia. These coins are minted until 115, at which time the Roman imperial focus was turning farther eastward. A map showing Trajan control of Arabia until Hegra (actual Madain Salih). The road links not only Bostra and Aqaba, which other than being a port doesn’t seem to hold much significance in the eyes of the imperial government, but also Petra, which sits at the center of the province, between the road's two termini. Though Trajan declared Bostra to be the capital of the province, he also awarded Petra the status of metropolis, as a sign that he agreed in the matter of its importance with his successor, Hadrian, who considered it to be more dignified and historic. Recently, evidence has been discovered that Roman legions occupied Madain Salih under Trajan in the Hijaz mountain area of northeastern Arabia, increasing the extension of the "Arabia Petraea" province south. With Roman conquest came the imposition of Latin and Greek in official discourse. This was standard for a province in Eastern Rome, but Arabia had far less of the history of Hellenization and Romanization than its neighbors, and the Greek language was little used before its introduction by the Romans. After the conquest, though, Greek was adopted popularly, as well as officially, practically supplanting Nabataean and Aramaic, as evidenced by inscriptions at Umm al Quttain. The occurrence of Latin in the province was rare and limited to such cases as the tomb inscription of T. Aninius Sextius Florentinus, governor in 127, and, somewhat paradoxically, in personal names. Millar makes a case for a Graeco-Roman Hellenization in Arabia. It is an area, after all, that was not significantly hellenized during the rule of Alexander, and the locals originally spoke their native language, not Greek. So with the introduction of Roman rule, along with many aspects of classic Roman socialization, such as public works and glorification of the military, came an introduction of some Greek cultural and social values. Arabia acclimates to the new culture so fully that it seems the original linguistic groups faded away. There were scattered Nabataean inscriptions during the period of imperial Roman rule. When Avidius Cassius rebelled against what he believed was a deceased Marcus Aurelius, he received no support from Arabia province, overlooked by some historians due likely to the fact that Arabia hadn't the wealth or political might of Syria. Arabia responded similarly when the governor of Syria, Pescennius Niger, proclaimed himself emperor in 193. When Septimius Severus came into power and stripped the Syrian city of Antioch of its status as Metropolis for its part in the rebellion and meted out punishment to any others who were unlucky enough to choose the wrong side, the Third Cyrenaica received the honorific "Severiana". In addition, the governor of Arabia, Publius Aelius Severianus Maximus, was allowed to continue in his post in reward for his loyalty. Syria was later split into two and Arabia was expanded to include the Lajat and Jebel Drūz, rough terrain south of Damascus, and also the birthplace of M. Julius Phillipus — Philip the Arab. Severus had enlarged a province that was already huge. He then proceeded to enlarge the empire, through the conquest of Mesopotamia. The transfer of the Leja’ and Jebel Drūz seemed to have been part of a shrewd series of political acts on the emperor's part to consolidate control of the area before this conquest. Arabia became the ideological power base for Septemius Severus in the Roman Near East. The obvious need to mitigate and tame the power of the province of Syria, which had shown itself over and over to be a hotbed of rebellion, was then accomplished in three parts: The aforementioned reorganization of Syria into two political units, the reduction of its territory in favor of Arabia, and the marriage of the emperor to the shrewd Julia Domna. Arabia became such a symbol of loyalty to Severus and the empire, according to Bowersock, that during his war against Clodius Albinus, in Gaul, Syrian opponents propagated a rumour that the Third Cyrenaica had defected. That it would matter to an issue in Gallia that a single legion in a backwater province on the other side of the empire would rebel indicates the political sway that Arabia had amassed. Not a land of significant population, or resources or even strategic position, it had become a bedrock of Roman culture. That it was an Eastern Roman culture didn't seem to dilute its effectiveness in matters in the west. It is precisely because Arabia had so little that it was able to define itself as Roman and that spurred its loyalty to an Imperial Rome that may never have existed. With Emperor Diocletian's restructuring of the empire in 284–305, Arabia province was enlarged to include parts of modern-day Israel. Arabia after Diocletian became a part of the Diocese of the East, which was part of the Prefecture of Oriens. First as part of the Diocese of the East, Arabia turned a frontline of Byzantine-Sassanid Wars. In the 5th or 6th century it was transformed into Palaestina Salutaris. ^ Kesting, Piney (2001). "Well of Good Fortune". Saudi Aramco World. Retrieved March 31, 2016.